""Perhaps no one has ever told the tale of Robinson's arrival in the major leagues] so well as Simon] does in this extended essay."" ""Scott Simon tells a compelling story of risk and sacrifice, profound ugliness and profound grace, defiance and almost unimaginable courage. This is a meticulously researched, insightful, beautifully written book, one that should be read, reread, and remembered."" 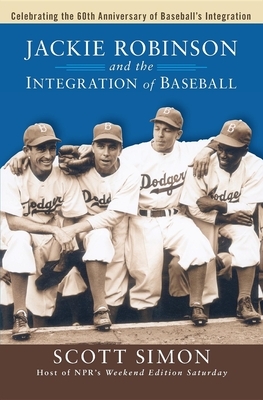 The integration of baseball in 1947 had undeniable significance for the civil rights movement and American history. Thanks to Jackie Robinson, a barrier that had once been believed to be permanent was shattered--paving the way for scores of African Americans who wanted nothing more than to be granted the same rights as any other human being. In this book, renowned broadcaster Scott Simon reveals how Robinson's heroism brought the country face-to-face with the question of racial equality. From his days in the army to his ascent to the major leagues, Robinson battled bigotry at every turn. Simon deftly traces the journey of the rookie who became Rookie of the Year, recalling the taunts and threats, the stolen bases and the slides to home plate, the trials and triumphs. Robinson's number, 42, has been retired by every club in major league baseball--in homage to the man who had to hang his first Brooklyn Dodgers uniform on a hook rather than in a locker. Scott Simon, the host of NPR's "Weekend Edition Saturday with Scott Simon," has won every major award in broadcasting for his personal essays, war reporting, and commentary. He is also the author of "Home and Away: Memoir of a Fan and Pretty Birds," a novel about two teenagers during the siege of Sarajevo.